The Van Lodenstein College (‘VLC’) is a Reformed secondary education school. The Bible, God’s Word is our basis. We also accept the three forms of unity. These confessional writings are valid and reliable sources representing a summary of The Bible. The Van Lodenstein College provides quality education. It is our belief that education must associate with our pupil’s talents and interests. It’s the school’s ambition to prepare students for subsequent education and/or employment. We also devote a great deal of attention to the spiritual education of young people. With it we fully share the tradition of Christian families and churches. The comprehensive development of young people stands in the perspective of the great commandment of Christ according to Mark 12: Love God above all and your neighbour as yourself. This is what we consider every day before, during and after the lessons. The Van Lodenstein College consists of five schools in The Netherlands. 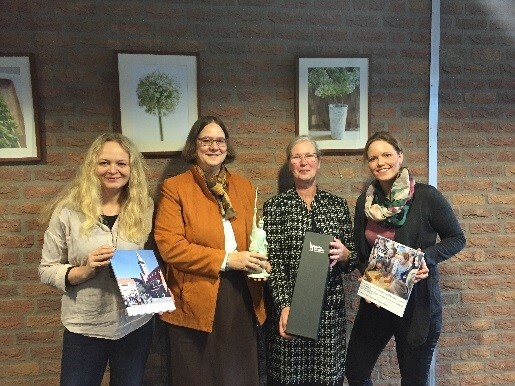 Four of them maintain inspiring relationschips with schools abroad. Since 2009 there have been annual exchanges between the August Hermann Francke schools (AHF) in Detmold and our school. At first we met colleagues and we visited each others’ lessons. Now there are exchanges in grade 9. They take place in turn in Amersfoort or Detmold. Every year we form groups. One German group communicates with our bilingual class in English. The other groups do the same in German. In 2016 contracts for official partnership were signed. We are very pleased with this inspiring cooperation! We have also had connections with the Vilniaus Krikščionų Gimnazija (Vilnius Christian Gymnasium) in the Lithuanian capital since February 2018. During the introductory visit our team members received a warm welcome. The small school is the only Protestant school for primary and secondary education in a mainly Roman Catholic and atheist country. The teachers want to teach Christian education from their heart! The school is located in the same building as the church. Children are educated in small groups, with an average number of 13 pupils per group. In May 2018 these Lithuanian teachers visited our Dutch school. In the near future we want to organize a first exchange visit of two days. Possible topics to work on are: World War II or the Cold War, churches, landscape, biology, the Hanze, Christian symbols, etc. We are looking forward to an annual exchange. Our location in Barneveld has a sister school in Sarospatak, Hungary, the Reformatus Kollegium. Every year third year students from Barneveld have an exchange with the students from Hungary. They visit us for a week and vice versa. In this week the students stay in their respective host families, go on excursions locally and further away and follow an intense educational program. All in all it is a life-changing experience for all involved! Location Hoevelaken has contacts with a Reformed School for secondary education in Sárospatak, a city in northern Hungary, near the Slovakian border. This year for the first time an exchange took place with a small group of students from our school accompanied by two teachers who stayed a week in Hungary. The students participated in the educational program, in which both German and English were spoken. In September a group of Hungarian students will follow a week’s lesson at our location. In addition, Hoevelaken has started an exchange with Eastern Christian School (EAS) from Wyckoff, near New York, USA. In April 2018 a group of eight students, who have a connection with the Netherlands through their parents or grandparents, visited our school. They not only attended different lessons (in English), but also became acquainted with Dutch culture. In autumn 2018 a group from our school hopes to stay in Wyckoff for a week. In April 2018 students and teachers from EAS visited our school. Our location of the Van Lodenstein College in Kesteren is having contacts with a Reformed secondary school in Myskolc, a city in the eastern parts of Hungary. The school is situated in a beautiful monumental building from the 19th-century and has a history that goes back to the times of the Reformation itself. One of the remarkable similarities between the Dutch Reformed Churches and the Hungarian Reformed Churches is historical: lots of Hungarian pastors studied theology in the Netherlands during the 17th and 18th century. We have an exchange program on a small scale. Our students in year 2V are allowed to take part in an application procedure on a voluntary base. Every year we take ten students to Hungary and the same amount is coming back to visit our school for a week. 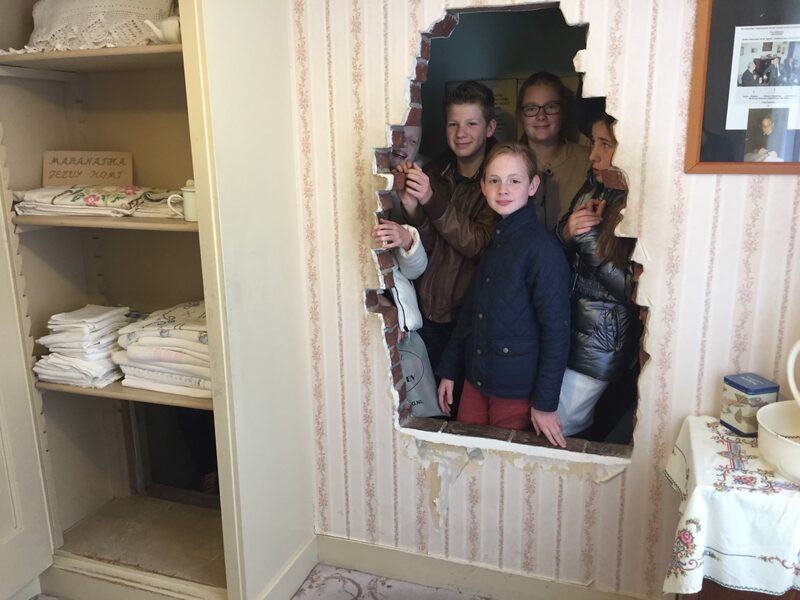 Hungarian students during a visit to the Corrie ten Boomhuis (museum) in Haarlem, The Netherlands.